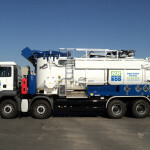 Vacuum Trucks are an economical solution for industrial waste management in South Africa, as well as an affordable and effective option for scheduled maintenance and emergency response services. A vacuum truck is a tank truck with a heavy duty vacuum. This vacuum is designed with the purpose of pneumatically loading various hazardous and non-hazardous materials for environmental clean-up, industrial clean up and mining operations. What Materials Can Vacuum Trucks Remove? What Applications are Vacuum Trucks Used For? They are capable of recovering bulk products or valuable commodities. 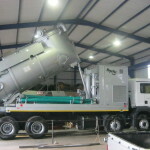 Discharge for re-utilisation by high-lift system into skips or big-bags. Discharge, for storage, by blow-back system into silos. ADR certified, capable of loading hazardous products. Large suction power capable of handling heavy products through long hose lengths. Ultimate filter capacity for 100% dust free exhaust air. Suction arm for vacuum excavation which can be used for mining of hazardous products or in area’s with underground infrastructure such as cables or piping. Self-discharging rear door with blowing unit. What is the Best Air Displacement System? The KOKS MegaVac is the perfect air displacement system for heavy duty suction, displacement and transportation activities in the construction and petro chemical industries and for all general industrial applications. 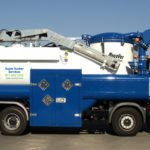 Megavac is suitable for the suction of all sludge’s and liquids as well as for suction and blowing sand, gravel, pebble stone, blasting grit, powders, cement dust, fly ash. Rescue Rod provides critical services for daily maintenance, turnarounds and outages at facilities across South Africa. 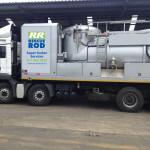 If you are looking for an Industrial Vacuum Truck then contact us today to find out how we can help you.